FELTspace presents an exciting, ephemeral, public art offsite project in 2014 titled 'FELTmaps'. In late 2013 FELTspace secured Unexpected Port funding through Renewal SA and the City of Port Adelaide Enfield, to host an ephemeral public art project responding to the small, the large, the public and the hidden, in central Port Adelaide. Approximately 20 South Australian artists and artist collectives, created temporary, site specific work for this event. FELTmaps hauled art out of the traditional white-wall gallery and asked artists to respond to the built and natural landscape of Port Adelaide, creating a beautiful map of artworks to be found in the suburban, the industrial and the everyday. The month-long outdoor exhibition included a series of tours and events held at the Vitalstatistix Waterside Hall, allow the audience to experience and respond to the art works. The exhibition culminated in a closing event - a one night ‘live art’ show at Waterside, presenting a series of responses and reinterpretations of the exhibition, from performers, writers, sound artists and others. As an outsider, Lily has found Port Adelaide a confounding place to get to grips with, but this process of gaining familiarity and a sense of one's orientation an interesting one. The unique urban geography and architectural features that initially make for somewhat troublesome navigation also manifest in compelling satellite and aerial views. In Vantage Points a series of walking trail signs installed across Port Adelaide map out alternate trails through the city, inviting exploration of areas of 'The Port' busy and quiet. These individual points also enable visitors to project themselves above discrete portions of the city, as one might once have done by climbing the nearest tall tree. Lily Ahlefeldt is an emerging visual artist working primarily with installation sculpture and animation. She holds a deep fascination with 'human space' which in turn forms the overriding focus of her practice. Her ongoing child-like tendency to climb architecture, and balance precariously on furniture to reach things in her everyday negotiation of the world feeds into her practice. Lily makes work that invites diverse, optional, and primarily gentle acts of participation. Through this she seeks to examine the encounter between viewers/people and artwork, and the experience and expectations of gallery visiting. Lily completed honours in visual art at Adelaide Central School of Art in 2013. Floral Decay depicts the artist in festishistic garb, filmed in the industrial landscape of Port Adelaide, subtly spliced amidst a blooming hyper-colour rose. The final product has been 'queered' using analogue video synthesizers to create a luminous reflection of 'man-made' beauty. Celeste is an emerging interdisciplinary artist and graduate of the South Australian School of Art, where she completed a Bachelor of Visual Arts: 1st Class Honours, in 2011. Her studio practice concerns contemporary feminist studies, specifically focusing on the popular culture associated with young women and intersections with new-age spirituality, significant at an international level in its raw newness and equally its democratic class and taste base. She employs craft and material-centric methods, creating sculpture with a charged femininity that recall apotropaic magic: natural and industrial fetishist materials are combined, becoming 'activated' conduits of energy through their union. Location: around the planter boxes on the wharf. Land meets sea in a transitional zone, where solid becomes fluid, floating meets stable and drifting meets grounded. The tides mark the ongoing dispute over a constantly shifting border, day by day revised and reclaimed. Past meets future in a similarly fluid transitional zone. We mark special moments and circumscribe boundaries like 'days' and 'weeks' to regulate its passage and still it ebbs and flows gently, unceasingly. We take photos and collect mementos and rebuild and restore and recall and revisit and retell to anchor in the past, while sailing towards our future. Choose your vessel, stand on the deck and set your course. Navigate your way out through the channel and into the ocean beyond. Tamara Baillie works primarily in sculpture and installation. Born to a family of boatmakers and fishermen, she grew up by the sea and frequently uses maritime motifs as a means to explore personal and collective narratives around identity and memory. A graduate of Adelaide Centre for the Arts, Tamara is the 2014 recipient of the Klein Family Foundation/Helpmann Academy Studio at Fontanelle. She is currently pursuing studies towards both a Master of Visual Arts and a Doctor of Medicine. Take home a piece of art! Edition offers a collection of small free pieces of art, available to everyone in Port Adelaide. These works come as small drawings each part of a set, individually numbered and available in shops, cafes and community centres around the Port. The drawings made by the artists of Bomb collective will appear then re-appear, altered afresh each week over the month of FELTmaps. Combined they will form a set of ideas and snapshots about and for the Port. These works test a model of public art that is fundamentally about dissemination, shared access and the effect of gifts in changing public space. Using humble means and ordinary materials these little artworks attempt to circulate themselves from one person to another, without return or gain. The offerings require no place to go to experience art or space to be filled by art. They want to make art transitional, circulatory; nomadic. Please take one, or two, you can pass it on. Maybe make up a story or draw over it. These are tiny moments to be collected and shared, grown upon, enjoyed or simply forgotten. Bomb collective comprises 3 emerging artists; Jess Miley, Ellen Buttrose and John Pagnozzi whose work explores spatial practices that disrupt the perception and experience of public space. Working between the realms of design and live art, bomb collective seek to interrogate public space, spatial justice and land based poetics and their influence on and meaning for arts practice. Tom's installation is a scattered arrangement of 100 painted boxes amongst the rocks that form the embankment for Hart's Bridge. This postdigital intervention is a physical articulation of the structural and visual cues of digital industry. These bright blue pixel-like forms also echo the aesthetic and material uniformity of the rocks that form the structural reinforcement for the industrial shoreline of the the Port River. Tom Borgas is an emerging artist based in Adelaide, South Australia. Through the articulation and integration of overtly digital and analogue motifs and processes, his expanded sculptural practice investigates the formal and conceptual richness that exists at the juncture of nature and culture. Following graduation from a Bachelor of Visual Arts at Adelaide College of the Arts Tom went on to be awarded first class honours at the University of South Australia in 2013. His work has been exhibited at shows and galleries around Australia including FELTspace ARI, the 2013 & 2014 Helpmann Academy Graduate exhibitions and Hatched 2013- the national graduate exhibition at the Perth Institute of Contemporary Art. He was awarded the NAVA Ignition Prize for professional practice in 2012 as well as the Hill Smith Gallery/Helpmann Academy Friends Award and Backers Prize in 2013. Nic utlises a domestic vocabulary of knitted-craft combined with furniture of the home to create work in response to the mangrove swamp that was once situated in the immediate Port Adelaide area before European settlement. In particular Nic references the pneumatophores (aerial roots) of the avicennia marina, otherwise known as the grey or white mangrove. Bone coloured, french-knitted sculptural forms - based on the shape and nature of pneumatophores - with large, faceted drop beads hang low over an antique mahogany table. The prism-like beads speak of the glistening, residual watermarks often present on pneumatophores and also allude to the chandelier - a luxurious, decorative fixture of a European past. Nic Brown is an Adelaide-based artist who works across the platforms of painting and installation to explore notions of home, memory and the natural world. She has an ongoing interest in public sites and since 2010 has presented four temporary public installations at the Adelaide Botanic Garden Nic holds a Bachelor of Visual Art (Hons), 2008, from Adelaide Central School of Art with a major in painting. She undertook post-graduate studies in Art History at The University of Adelaide in 2009-10. In 2013 Nic was awarded the Australian Experimental Art Foundation CIBO Studio Residency at the British School at Rome and will undertake a three-month residency at the School in 2014. She was Finalist for the Bank SA Award - Best Visual Art and Design and the Eran Svigos Award for Best Visual Art in 2013. Nic was awarded the Saint Ignatius Emerging Artist Prize in 2011; SALife Emerging Artist Award in 2010; Kidman Art Prize for Watercolour in 2009; and an Adelaide Central School of Art Scholarship in 2007.Nic has participated in solo and group exhibitions in Adelaide and Melbourne at SASA Gallery; Fontanelle; Format; Adelaide Botanic Garden; Next Wave Festival; Queens Theatre; A Room of Her Own; Light Square Gallery; The Cedars; Hahndorf Academy; and Adelaide Central Gallery. Nic is currently developing new work for Carry Me a Country Arts project set to tour regional South Australia in 2014-15. PSI is a multi-sensory sculptural installation made of helium filled balloons tied to an anchored net. The seven metre high structure is made from 250 pink balloons of varying sizes. It is a sculpture which has no fixed shape - its perpetual randomness is its own unique state of resolution. The amorphous blob of floating pink balloons evoke a childlike and playful way of interacting with the physical world rather than a didactic interaction through language. Playing with restrictions of space, of rules, and of gravity, it seeks to create a totally absorbing physical experience which invites a physical response from the viewer. PSI skirts around prescribed readings or meaning and invites the spectator to a sensual experience. This approach makes its primary concern the material appeal of an artwork in space which extends on the material or physical experience of being in the world. Carmody (born 1988) spent her formative years in Indonesia; and in 2011 graduated with a Bachelor of Visual Arts (Honours) at the South Australian School of Art. Carmody has exhibited in group and solo exhibitions in public, commercial and artist-run spaces including Contemporary Art Centre of South Australia, Greenaway Art Gallery, Form/Midland Atelier (WA), SASA Gallery, Spectrum Project Space, (WA), Pingyao International Photography Festival (China), and Mint: The Impossible Project (Hong Kong). Listening to, and with, abandoned buildings. An artwork exploring emptiness and the actions of close listening, waiting and hoping. Broadcasts from Empty Rooms presents night-time soundscapes from vacant buildings in Port Adelaide. A live internet radio stream connects you to inaccessible places, broadcasting the atmospheric sound from a different deserted building every Saturday night during the FELTmaps project. Sasha Grbichis and artist, writer and lecturer working in the field of visual arts, in particular sculptural installation, sound and video art. An avid collector of strange things, sounds and stories; she is fascinated by the ways art interacts with experience. Sasha creates works that explore how art might operate within communities and local environments. Sasha has had her work shown extensively in experimental art spaces around Australia, is a current postgraduate research candidate at University SA and lecturer at the Adelaide Central School of Art. Heidi Angoveis a technologist. Her experience in the Arts sector has been as a collaborator, a production/ new media contributor and producer of various theatre and visual arts projects, and as the General Manager of the Australian Network for Art and Technology. Heidi has 15 years of computing experience, having worked for leading broadband provider, Internode for over 13 years. In short, she has a deep seated and long-term engagement with technology, and making that technology work for people who make excellent work. Live streaming every Saturday night during FELTmaps (March 28 - April 26) from 10pm until the early hours. Ray discovered that Port Adelaide has one of the largest ship graveyards of ghost ships in Australia. Her work references the psychology and dramas of self, and one of the most looming issues within this is theconcept of death and ceasing to exist as the person you have spent you life being. For FELTmaps Ray has built a large ship with portholes that contain scenes, segments from life or self. Ray's work usually references the duality of our inner and outer life and being, in this case the ship the outer/ the body and inside the portholes the inner/thought/feeling. Utilising the old metaphor of Navigating the seas of life, no matter how calm or stormy to end up in a ship graveyard.The ship like a ghost ship will be beached on the land, abandoned and hopeless, similar to a grave only signifying what life might once have been. But inside will be little glimpses of activity, of that life, fantasies of what was or might have been. The reference to fantasy is a usual reference for Ray, though usually as a psychological tool of coping etc, but in keeping with the site and the ship as metaphor these fantasies or moments will be more nautical based. The ships will have large sails that blow in the wind, exposing our vulnerability to the elements, but also the ability to animate. Ray Harris is not a middle aged man but an emerging Adelaide artist exploring the psychological complexities and struggles of the self. Her focus is on the compulsion of everyday delusional or fantasy states, as a means to direct the uncontainable hunger of the void, fill what is missing or repair the unrepairable, and manage repressed desires, anxieties, and emotional wounds. She explores these issues through subjective interpretations of universal conditions, creating installations and self-performed videos. The associated bodies of work represent the two often oppositional but fundamental aspects of a person's mental functioning and identity, their inner thought and outer behaviour. Pvc Piping, wood, rope, powerless illuminating tubing. From its shelf of origin. This would prefer to be water. Brad Lay works across a variety of media, including sculpture, installation, photography, video and drawing. He is simultaneously addicted to and terrified by the ocean, and wonders if this sort of thing also happens to other people. His work has been exhibited in Australia, New Zealand, the United States and the UK, and he is currently completing a Masters by Research at the University of South Australia. "The vicissitudes of existence over time, to which all humans are susceptible, could not be clearer than in the breaks, the knocks, and the shattering to which ceramic ware too is subject." - James Henry Holland. And then some become strong in the broken places makes reference to the philosophy behind the Japanese art of 'kintsugi' - the belief that when something is damaged and has a history it becomes more beautiful. Chipped and broken bricks in a laneway have been mended with hand coloured Multi-Purpose Filler, with no attempt made to hide the damage. Instead, the repairs themselves are illuminated, celebrating the history of the use of the space and turning ugly breaks into beautiful fixes. Jessie Lumb is a South Australian artist working in the field of Sculpture and Installation. An obsessive observer of the little details we encounter in our everyday lives, her practice highlights the unnoticed details that make up our world. Her small scale, site specific interventions attempt to provoke in the viewer a greater understanding and experience of 'where we are', transforming the mundane into something wondrous and beautiful. A first class honours graduate of the School of Art, Architecture and Design (UniSA), Jessie won the Adelaide Critics Circle 2013 Emerging Visual Artist award. She was selected for Hatched 2010 National Graduate Exhibition at the Perth Institute of Contemporary Art and has exhibited throughout Adelaide, Melbourne and Hobart and in San Diego where she undertook a study based exchange. She has created temporary public artworks both individually and collaboratively in Adelaide, Melbourne, Tasmania and in Jingdezhen, China, the result of a six week residency undertaken in 2010. From 2011 - 2012 she spent a year as an Australian Youth Ambassador for Development working with the Arts Council of Mongolia in Ulaanbaatar, Mongolia. Jessie was a co-director of FELTspace from 2010-11 and is currently a co-director of Tarpspace Mobile ARI. Pink Rail was initially an installation of pink rope following the disused railway line on the wharf of Dock 1. The rope was deemed a tripping hazard, so now Derek is installing signage along the rail tracks at Hart's Mill that reads 'approved'. This work is a response to the perception certain spaces portray when it comes to gender and sexuality. Choosing a space that has a history of industry and functionality and is seen traditionally as a home of working class masculinity. This will be contrasted with the brightness of the pink rope compared with the drab and grey surrounds of the wharf and the impractical use of a practical masculine material. Derek Sargent is a sculpture and installation artist based in Adelaide. His work is concerned with the development of identity and sexuality in the formative years of adolescence. He explores the extent to which heteronormative culture enforces and oppresses imagery and thought. Focusing on how popular culture reinforces standard gender and sexual roles, Sargent subverts theses heteronormative structures by privileging queer imagery over the normative and by reinterpreting object and spaces to reflect the queer adolescent experience. He has twice been awarded the Chancellor's Letters of Commendation from the University of South Australia and is the current winner of the Constance Gordon-Johnson Sculpture and Installation Prize. In February of 2013 he became a co-director at the artist run initiative FELTspace. 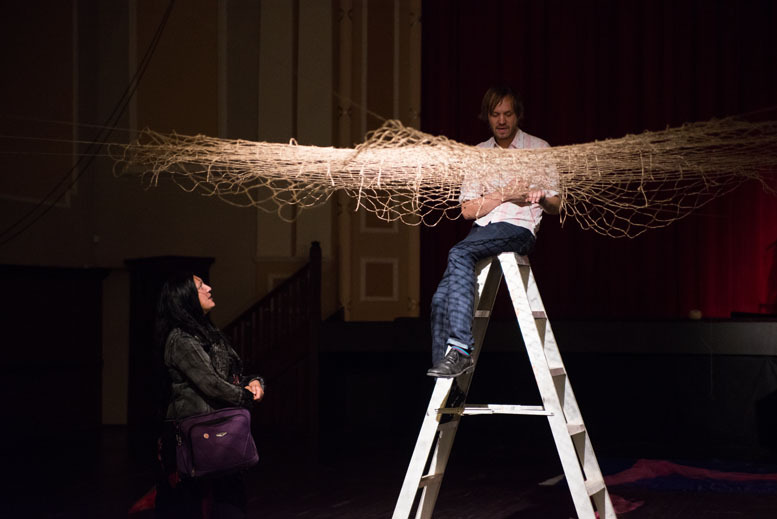 In the days leading up to (and during) the FELTmaps closing ‘live art’ event, Ryan hand knotted a circular fishing net out of twine. Going around and around in a spiral like formation from the centre out, Ryan sat at the top of a ladder knotting for hours on end - metaphorically netting together the stories of the hall, the port, and the FELTmaps exhibition as a whole. Carly's work explores the functional and visual qualities of common mass-produced objects and materials. Rules and limitations are then imbedded within a process imposed upon these items, celebrating their inherent function, and shifting their energy, to create engaging installations. For FELTmaps Carly is revisiting childhood techniques of making that utilise the basic common material - string. Through collecting and crocheting various colours and types of rope, string, twine and cord she is highlighting the human impulse for constant making and through the artistic gesture brings to light the possibility that an artwork may never begin or end. For over 150 years the International Maritime Signal Flag System has been used to send messages between ships. Consisting of only 36 flags - 26 letters and 10 numbers, used to spell words but each also with a message of its own - it could be considered a somewhat stilted conversation and, in our world of endless ways to stay in touch, a conversation no longer worth having. But there is something beautiful in the history of such a system and such sadness in its demise. An international language, relying on colours and shapes to be understood by all, is now only understood by a diminishing few, replaced by radio and satellite communications as technologies develop. During FELTmaps, tarpspace has teamed with the 95 year old Falie, Adelaide's only historic tall ship, itself slipping from the consciousness of contemporary life. No longer able to spend its days at sea, the conversation has shifted from ship-to-ship, to ship-to-shore, in an attempt to draw attention to two obsolete maritime technologies. Tarpspace is a mobile ARI that aims to extend the physical and conceptual framework of an art space. Rather than be restricted by a site, or even a form, the only consistent factor is the use of a large blue tarpaulin - works can be presented in around or on the tarpaulin or the tarpaulin itself can be used as a material for a work. Tarpspace is intended to be a simple, flexible alternative to a conventional gallery space and participating artists are encouraged to experiment with ideas that challenge notions of what an art space can be and where it can be presented. Facilitated by Henry Walker, Jessie Lumb and Brad Lay tarpspace travelled around Australia in 2013 creating new projects in regional areas, which were live streamed on the internet to create cross country connections. Tarpspace aims to invigorate artistic communities and engage groups who would normally be isolated from cutting edge contemporary practice. Chorusresponds to the sound scape of Port Adelaide (past and present) by using found and thrifted bells to take the place of the eight bells used to tell the time on ships(actually traditionally one bell, rung up to eight times). The work also hints at the passage of time and the temporal nature of the broader FELTmaps project. Visitors to Waterside are encouraged to join the chorus and ring the bells. Lara Torr is a visual artist and arts worker from Adelaide.Working across drawing, sculpture, textiles and installation, Lara's work often explores human interactions with objects. Just for something different, Lara directs a sad-song choir called Choral Grief and works as a freelance audio describer. Humans build systems. The world is full of them, operating around us all the time, but we're so saturated in them we often don't recognize them. Bruno Latour describes this phenomena as 'blackboxing', the way that 'scientific and technical work is made invisible by its own success. '1 Only when a system falters does it force its way to the surface of our attention. My works are embedded into these systems as anomalies, moments of the unanticipated. These encounters elicit a double-take, where the work punctures our expected reality. It can be likened to tripping over a tiny rise in the pavement - in that moment, the world fades out to be replaced by the fixation on something slightly out of place. Ash Tower is an Adelaide-based emerging artist. Working primarily in installation, Tower's work seeks to draw revelation from everyday systems, through subtle manipulation; transmuting systems like infrastructure, libraries and archives into elaborate social architectures. Tower is currently undertaking the Honours program at the Adelaide Central School of Art, in 2013 being awarded a Carclew Project and Development Grant, the 'James Martin Award for most Outstanding Graduate Student [BVA], as well as recently being invited to the Perth Institute for Contemporary Art's National Graduate exhibition, Hatched 2014. Meg's work for FELTmaps responds to the common misconception that a series of white boxes acting as 'homes', will attract a host of new tenants to an area - thus revitalising a seemingly dormant locale. The work is also meant to highlight the unfair attitude that is directed towards 'the Port', that "Oh, they keep trying to liven the place up, but they've been trying for thirty years! Things don't changeâ€¦"
Meg Wilson is an Adelaide based artist working with textiles and installation. Her practice responds to classic horror/thriller/mystery genre films, play scripts and novels. She explores transference between mediums, misinterpretation, human behaviour, and the point of view of the outsider. Wilson cites her visual art practice, studies in interior design, and theatre prop and set design practice as mutually influential. Employing unconventional painting techniques and highly repetitive textile processes such as knitting and weaving, she creates tactile and brightly coloured yet 'functionless' objects. Despite the work originating from imagery in literature, the objects avoid literal interpretation thus inviting a sensory response from the viewer. Her seemingly mundane objects are able to stimulate complex responses such as confusion, empathy, horror, and wonder. Wilson is an honours graduate from the South Australian School of Art, Unisa (2006) and has completed further studies in interior design. Recent exhibitions have been held at Constance ARI (TAS); Mechanical Gallery (SA); Tooth and Nail (SA); Fontanelle (SA); and FELTspace public art projects. Meg Wilson is a co-director of FELTspace ARI in Adelaide.